Many Video Clips on our Forum! The CW The Flash: "Godspeed - Tuesday, April 16 (8:00-9:00 p.m. ET) (Content Rating TBD) (HDTV) DANIELLE PANABAKER DIRECTS - Promo - After discovering that Nora (Jessica Parker Kennedy) is working with Thawne (Tom Cavanagh), Barry (Grant Gustin) and Iris (Candice Patton) disagree about how to handle their daughter in the wake of this shocking news. Team Flash isn't sure they can trust Nora, so they go through her journal to find out exactly how she came to work alongside their greatest nemesis. Danielle Panabaker directed the episode written by Judalina Neira & Kelly Wheeler (#518). Original airdate 4/16/2019. CICADA SEVERLY INJURES NORA — During a battle with Cicada (Chris Klein), Nora (Jessica Parker Kennedy) is severely injured. Due to Cicada’s dampening powers, Nora’s speed healing isn’t working, leaving Barry (Grant Gustin) and Iris (Candice Patton) scared for their daughter’s future. Upset about his injured child, The Flash is filled with rage and confronts Cicada in a brutal battle. Meanwhile, Killer Frost (Danielle Panabaker) keeps interfering with Caitlin’s work on the cure. Marcus Stokes directed the episode written by Judalina Neira & Thomas Pound (#511). Original airdate 1/22/2019. 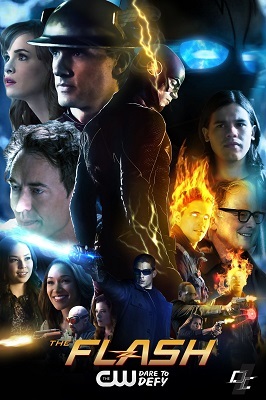 CAITLIN AND CISCO EMABRK ON A NEW JOURNEY — While Nora (Jessica Parker Kennedy) grapples with the revelation that Thawne (Tom Cavanagh) killed her grandmother, Team Flash must stop the formidable team-up of a newly sprung from jail Weather Witch (guest star Reina Hardesty) and Silver Ghost (guest star Gabrielle Walsh), a new meta-tech villain who can control engines and motorized technology. Meanwhile, Caitlin (Danielle Panabaker) and Cisco (Carlos Valdes) discuss creating a meta-human cure. David McWhirter directed the episode written by Kelly Wheeler & Sterling Gates (#510). Original airdate 1/15/2019. EPIC ELSEWORLDS CROSSOVER KICKS OFF TONIGHT - When Barry Allen (Grant Gustin) and Oliver Queen (guest star Stephen Amell) wake up one morning and realize they have swapped bodies with each other, the two set off to find out what disturbed the timeline to cause such a shift. However, things quickly go from bad to worse when they present their case to Team Flash and the gang doesn't believe them. Barry and Oliver realize they need Supergirl's (guest star Melissa Benoist) help and travel to Smallville on Earth-38 where they end up meeting Kara's cousin, Clark Kent (guest star Tyler Hoechlin), and intrepid reporter, Lois Lane (guest star Elizabeth Tulloch). LaMonica Garrett guest stars as The Monitor. Kevin Tancharoen directed the episode written by Eric Wallace & Sam Chalsen (#509). Original airdate 12/9/2018. Our other pages for current news and spoilers: B&B, Days, GH, Y&R, general daytime, Arrow, Beauty & The Beast, Big Bang Theory, Bones, Doctor Who, Elementary, Family Guy, Gotham, Grey's Anatomy, Law & Order, Marvel's Agents of S.H.I.E.L.D., Nashville, NCIS, Once Upon a Time, Sleepy Hollow, South Park, Supergirl, Supernatural, Teen Wolf, and Vampire Diaries.